Above images are for "free" stereo viewing - Parallel - click on image to view X-eyed. This car is a representation of the 2002 Thunderbird that appeared briefly in the anniversary Bond movie "Die Another Day" starring Pierce Brosnan as James Bond and Halle Berry as Jinx. 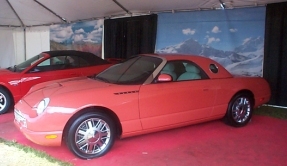 Halle was the driver of the Thunderbird in the movie. The movie premiered in the USA on November 22, 2002. It's reported that the original car was offered to Halle but she turned it down opting instead for an Evening Black 2002. Wonder what happened to the original?? 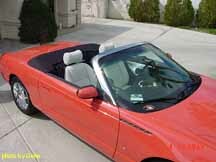 [see next paragraph] The car in the movie had a coral top instead of the white top offered with the special edition and was a 2002, not the 2003 that the edition comes as. 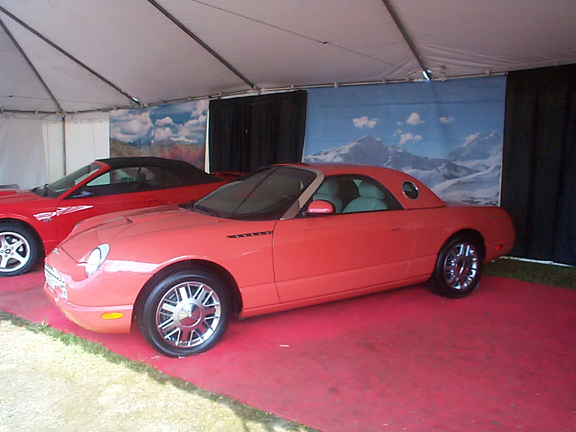 Update 2010: The movie car appeared on display at Ford's 100th Anniversary in 2003 at the Ford World Headquarters. The vin # ended with 0442 and was a 2002 model according to the person who sent me the following picture. I also had a report from inside Wixom that there were two models painted that color in early spring or late winter 2002. 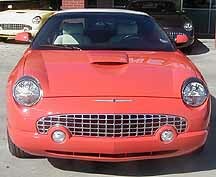 Just recently, May 2010, one of those cars was auctioned off for charity (Juvenile Diabetes Association), donated by a member of the Ford family. It's vin # ended with 0441 according to the Ford paper work that was available to those interested in the auction. An interesting bit of trivia went along with the car that was auctioned. 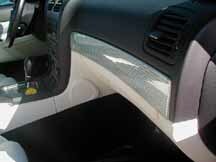 It stated that inside the trunk was a set of white slip covers for the car's role in the movie. They were not "on" the seats due to the covers not meeting air bag safety standards, ie, the seat side air bags would not deploy correctly with the slip covers in place. I don't have any other actual verification of the numbers other than reported to me. However I do have a picture of one of those cars in the Ford display area at the 100th Anniversary celebration in Dearborn that was sent to me this past year. A couple of diecast models have already been made of the movie version of the car. An 1/18 scale model from the Beanstalk Group and a 1/43 scale model by Minichamps - released the fall of 2002. 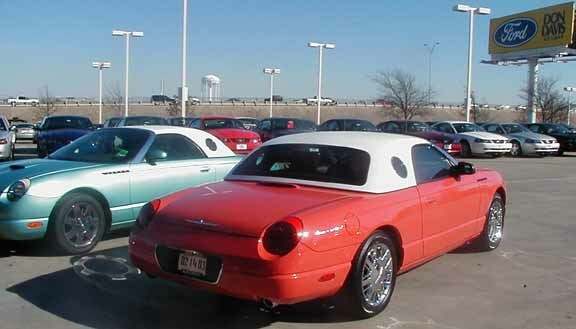 These models have the coral color hardtop. In the spring of 2003, the 1/18 was released with a white top - from the Beanstalk Group - to match the production cars. All 700 built for sale. - . 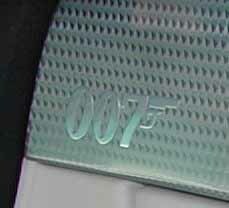 Some research has indicated that the glove box serial numbers were not assigned in any particular order so a later built 007 could have a serial number lower than an earlier built 007. Other information has surfaced that 6 were built for show. There were articles on the web of at least one of those at shows in India during 2002 and 2003. Above is the nose of the USA version of this edition. Above is the Canadian version of the 007 edition. Note the block off plates for the supplemental parking light bezels. Known facts now that the model is out of the factory: Ford had a sweepstakes for an 007 to go along with the opening of the "Die Another Day" movie. It ended December 2002. 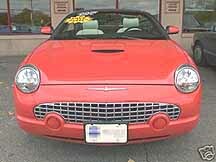 The first cars were officially "bucked" right after Christmas and started appearing in dealer's showrooms by mid January, 2003. Production ot the 007 ended sometime in March. All 700 were built and some were prepped early for shows in Europe. This limited editon features chrome 21-spoke wheels just like the Neiman Marcus editions had for 2002. 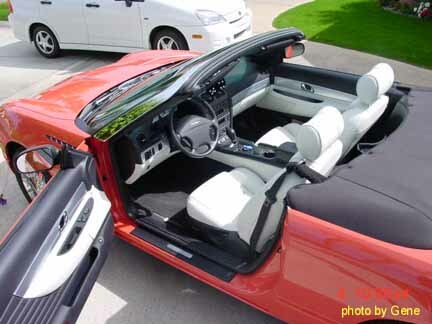 The seats are a solid "performance white" colored leather. 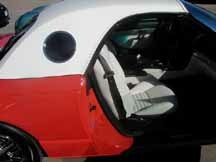 The doors are trimmed with white "wings" and the lower part of the dash is white. There is a "007" badge on the metal trim across the dash above the glove box. The hardtop color is "performance white." The steering wheel and shift knob are covered with "black ink" leather, a departure from the other "full accent" interiors. 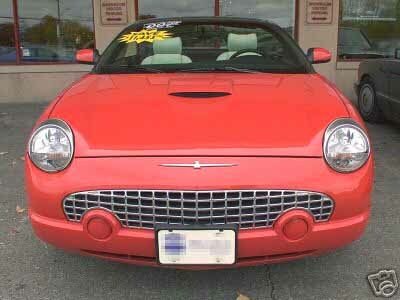 The transmission has the select shift automatic (an 03 option) and the 3.9L, 280hp engine which is standard for the 2003. Each 007 car has their own special plaque in the glove box, serializd from 001 to 700.
update: This edition is available in Canada. - 60 cars worth plus rumor that there are some for the European market. *Another bit of trivia - The color code CQ is also a Morse Code abbbreviation. I suppose to go along with the spy theme for the car. Interesting that some of the special color codes and body codes for the Thunderbird have alternate meanings.